Suspension bridges and a hollowed out white pine tree, all a part of the Wild Walk. Photo by Pink Me Not. Feel what it’s like to deeply immerse yourself in the sights, sounds, and smells of the Adirondacks in New York State. Perch in a bald eagles nest and observe the wind gust through the treetops, watch a bullfrog dive underwater as you paddle through the Oxbow, or touch a 1.3 billion-year-old rock, the oldest part of New York. 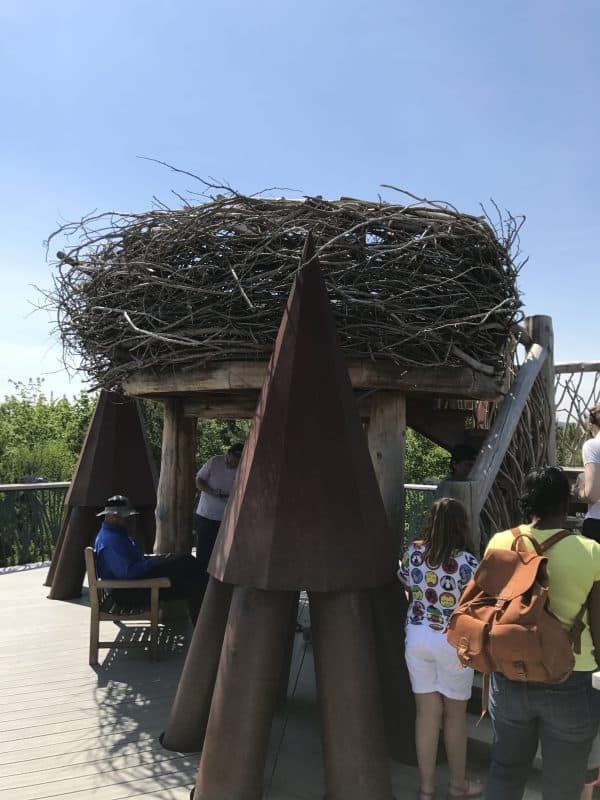 Life-sized bald eagles nest, the highest point of the Wild Walk. Olivia Gilmore photos. 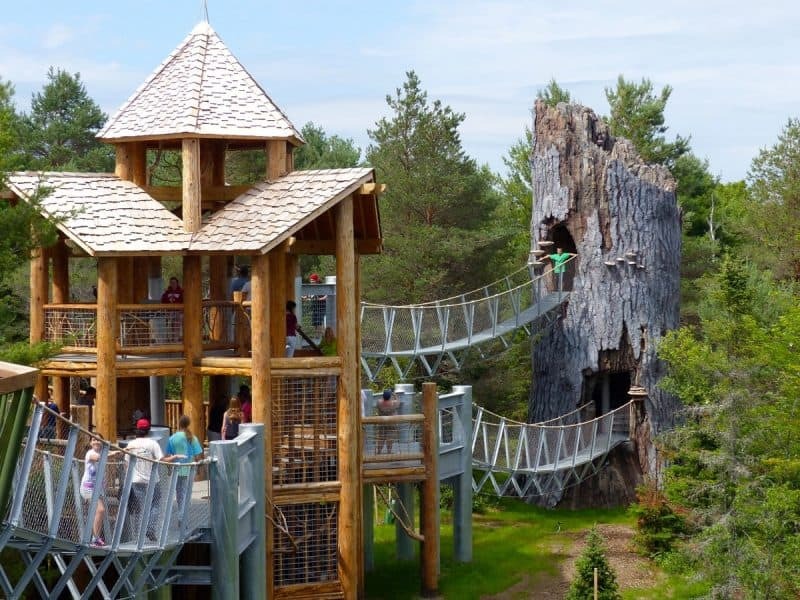 In the heart of the Adirondacks, 81-acre The Wild Center incorporates the importance of preserving nature and animal wildlife, all while being able to explore the wonders of Adirondack forest through interactive exhibits, walking among the treetops in a life-sized spiders nest, coming face to face with an otter named Louie, and so much more. With the fast moving pace of life, sometimes it can be hard to appreciate nature and all of its beauty. The Wild Center offers its visitors several different ways to connect with nature, whether it be through the iForest, Wild Walk, animal exhibits or the other half a dozen activities the center’s offers, guests can certainly expect to be entertained throughout their whole visit at The Wild Center. Experiencing the iForest as the sun rises. Sounds of singing can be heard while you walk. Picture this, you begin walking into the forest, it is deep with underbrush and thicket, but there is a narrow path leading you inwards towards a variety of pine trees. Just as you start to appreciate the quietness of the forest, you hear a subtle hum and a delicate chorus of voices starts singing a soothing melody. As soon as you locate where one voice is coming from it quickly changes and another one emerges, dozens of voices send you into musical catharsis. 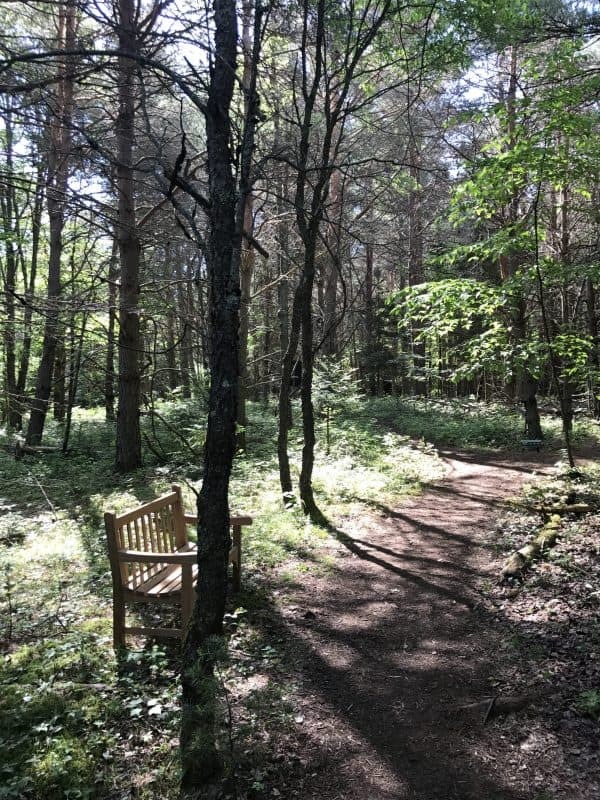 You’ve walked about 60 feet along the path, with each step, the music evolves, you find the nearest wooden bench and sit down. Eyes closed, you listen how each unique sound contributes to the overall choral group, hearing bits and pieces of the Mohawk language. Distant birds chirp calmly as even they seem to appreciate the musical stimulation. Breath in, breath out, this is the iForest Experience. Deep into the Adirondack forest, British Composer Pete M. Wyer hid 24 different speakers equipped with 72 individually recorded voices into the surrounding forest. Designed to deepen humans connection with nature, the one of a kind auditory experience will take its visitors on a ? mile loop through the forest. The wind, the leaves, and the birds all work together to elegantly contribute to the symphony, creating a song sung by the forest itself. 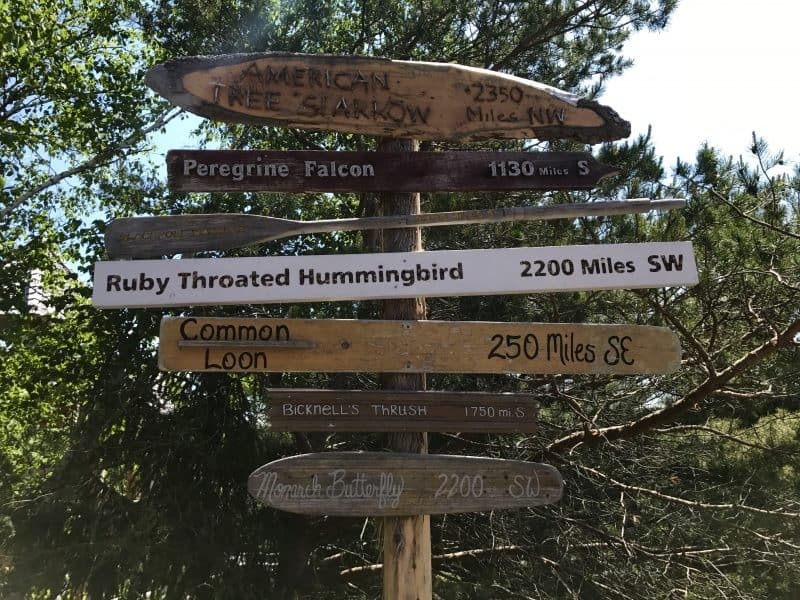 Makeshift sign at The Wild Center pointing out different locations near and far. Composer, Pete M. Wyer is a musician with an interest in musical storytelling and innovation. Wyer composed the piece titled, “I Walk Towards Myself” specifically for the installation of the IForest. The contemporary choral music group, The Crossing, incorporated the Mohawk language into parts of their song as a way to appreciate the Native culture. The artistic creation is best enjoyed when listeners move at their own pace through the forest, leaving room between themselves and others. Depending on the weather, time of day, and walking pace, the music on the trail is always different. Visit the iForest as many times as you’d like, each time will be a whole new musical experience. The “Immersive Forest Sound Installation”, nicknamed “iForest” is scheduled to remain open until Columbus Day 2017. Rain or shine, visitors can experience one of the first ever immersive art installations in the world whenever the museum is open. Ever wonder what it’s like perch in a bald eagles nest? Or maybe relax in a life-sized spider web thirty feet off the ground? Prepare to see, hear, and feel the world the way animals do as the Wild Walk experience brings its guests on a canopy walkway across the treetops. 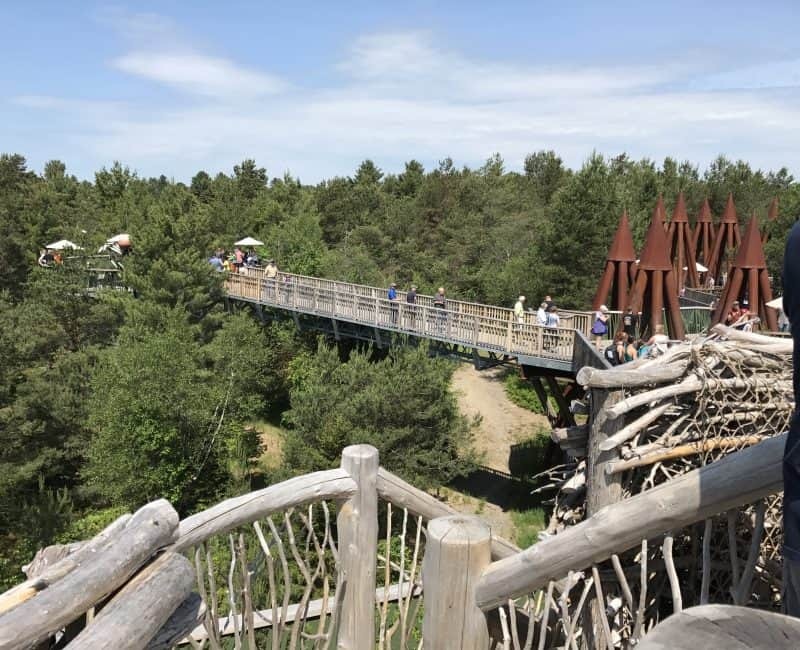 Including a four-story twig treehouse, suspension bridges, spiders web, bald eagles nest, and ginormous tree with a spiral stairwell, the Wild Walk brings a whole new perspective to the forest. Walking among the tree top canopy in the Adirondacks. What makes the Wild Walk so extraordinary is not only its breath-taking views of the skyline and of New York, but its educational portion of the walk. Each major attraction in the Wild Walk is equipped with information about the nature surrounding it. Never knew white pines were the tallest trees in the Adirondacks and can fit people inside them? Well now you do! With dozens of exhibits at hand, the Hall of the Adirondacks allows for a deeper appreciation of fish, turtles, plants, and other species that roam in this specific area. Get a chance to feel how cold a frozen glacier is or experience what it’s like to walk across a bed of forest moss. Each exhibit offers an interactive component, bringing the Adirondacks and it’s natural world to life. The Wild Center is home to more than 900 live Adirondack animals, including an adorable and friendly little otter named Louie. Dip your hands into the river exhibition and feel rainbow trout slide beneath your fingers. Learn about the creepy crawlers and wild animals that find safe haven at The Wild Center Museum. Or watch Louie glide, swirl, and dive in the Otter Falls exhibit, of course that’s if he’s not lounging or eating snacks. With so many live creatures, it can be difficult to choose which exhibit to visit first. Porcupines, birds, reptiles, and amphibians also occupy the area, they can even be seen up close during an Animal Encounter with one of the centers Naturalists. After getting the opportunity to see some of the animals, stop by the Flammer Theater, where different feature films are shown everyday, such as A Matter of Degrees and The Wild Adirondacks. Don’t forget about Planet Adirondack, where you can see a 3-D space-eye view of the earth and its natural events. Becoming close with nature means actually experiencing it first-hand, right? Luckily The Wild Center offers both canoe and paddle boarding trips, bringing you even closer to the Adirondacks wildlife. 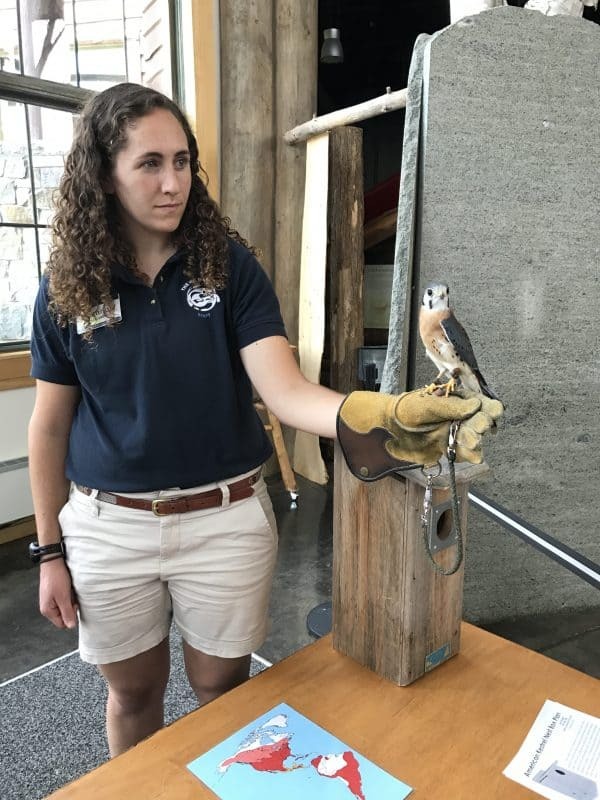 An upclose Animal Encounter with an American Kestrel, held by one of the centers Naturalists. Each individualized tour brings you around the Raquette River’s Oxbow. 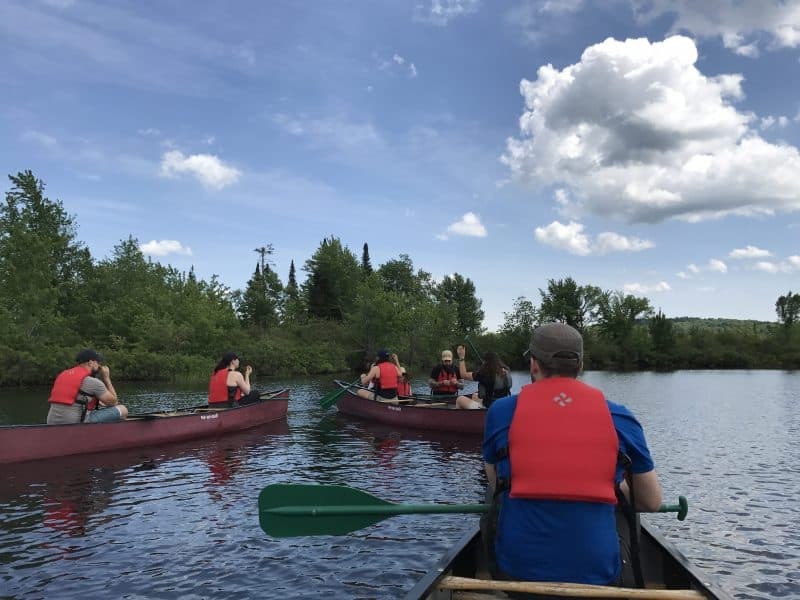 Get ready to paddle as you will be exploring different marsh habitats, and who knows, you might even see a bald eagle and some other furry creatures. Trips are led by NYS Licensed Guides and Wild Center Naturalists, as they are there to answer any questions you may have about the river, its history, and those who inhabit it. Boats can hold up to two adults and two smaller children, and life jackets are provided. If you are looking to get away from the craze of The Wild Center, then the calm essence of the river is a perfect place to sit back, relax, and paddle down stream. Talk about a meal with a view. The Waterside Cafe, located conveniently inside the Wild Center, is a one stop spot to grab a quick sandwich and lounge waterfront to the Greenleaf Pond. Canoeing down the Raquette River’s Oxbow, learning about marsh habitats that thrive in the river. Not to mention, seeing a bald eagle up close! The cafe has both indoor and outdoor seating, and during the summer months you can find local meats, cheeses, and vegetables steaming on the grill. The center grows their own herbs, and works to incorporate different flavors into their ever-changing menu. Most importantly, all of their packaging materials are either made of out either biodegradable, recyclable, or compostable materials. Summer ticket prices, including the Wild Walk, are $13 for youth and $20 for adults. Children under 4 are free and tickets are good for two consecutive days. The Wild Center and Wild Walk are open daily from 10 a.m. to 6 p.m. from Memorial Day Weekend to Labor Day and 10 a.m. to 5 p.m. from Labor Day to Columbus Day. For more information, visit the hours and admissions page. Take a walk through iForest!